Some swim for exercise, others for a sense of accomplishment or to achieve personal bests. Since my 50s, I’ve swum mostly for the sheer pleasure of it. If it’s not fun, why do it? Exercise? That ‘happens.’ And meaningful goals are never far from mind. But what I want most is to feel engaged in body, mind, spirit–that there’s nothing I’d rather be doing and to leave the pool counting the hours until I can swim again. Even in an aging 25-yard chlorine-scented box, I have literally magical moments virtually every time. As good as that may sound, my peak experience in swimming is swimming with friends in a beautiful natural setting. 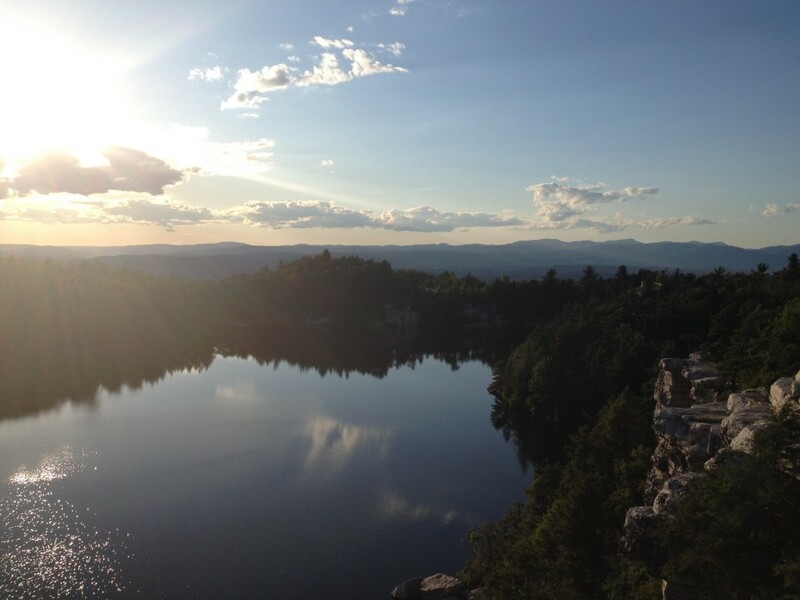 It’s hard to surpass the Shawangunk ‘Sky Lakes’ where I swim as often as possible from early May to late October. My most memorable experiences of all happen during swimming ‘treks’–swims that belong on any swimmer’s bucket list. During these, I explore a part of ‘Planet Water to which access is granted only to a few. Think of these as a swimmer’s Mount Everest–one that puts you in far more exclusive company, at a fraction of the expense . . . and no risk of falling into a crevasse or being caught in an avalanche. Such an experience is made far richer when shared with friends, such as Lennart and Tommi. Lennart, 66, is chairman of Oppboga, a packaging company in Orebro, Sweden. He began swimming at age 57, after running dozens of marathons–including an impressive five sub-2:35. Lennart became a TI swimmer early on and has completed about 15 marathon swims in his 60s, including the challenging Gertrude Ederle Swim in NY, and–twice–the 22K Vidostern in Sweden. Lennart’s greatest pleasure is informal, self-organized swims with friends for fun. 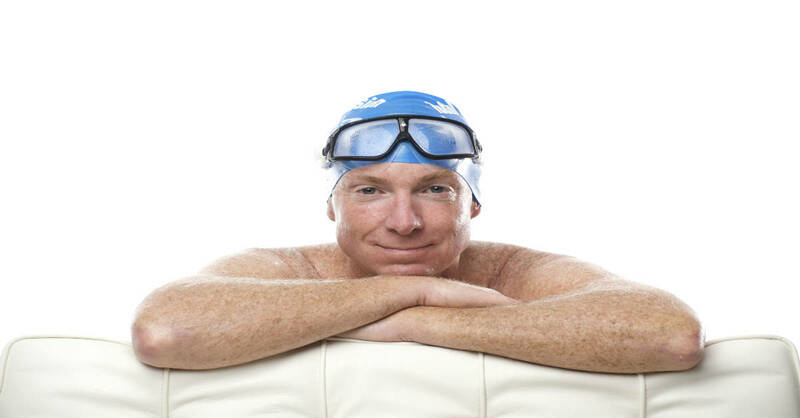 Tommi, 47, began swimming at age 40. At a TI Open Water Experience in St John USVI, Tommi fell in love with long open water swims. Because of the demands of his work as a cardiothoracic surgeon, Tommi can train only four to five hours a week. Even so, he completed the 28.5-mile Manhattan Island Marathon June 28 of last year, placing 3rd of 23 swimmers and still feeling fresh after nine hours. In 2016, Tommi plans to tackle Catalina Channel, swim from Mallorca to Menorca . . . and book a 2017 English Channel slot. We swam Gibraltar Strait in Oct. 2013, covering the 18K from Spain to Morocco in 5:11. 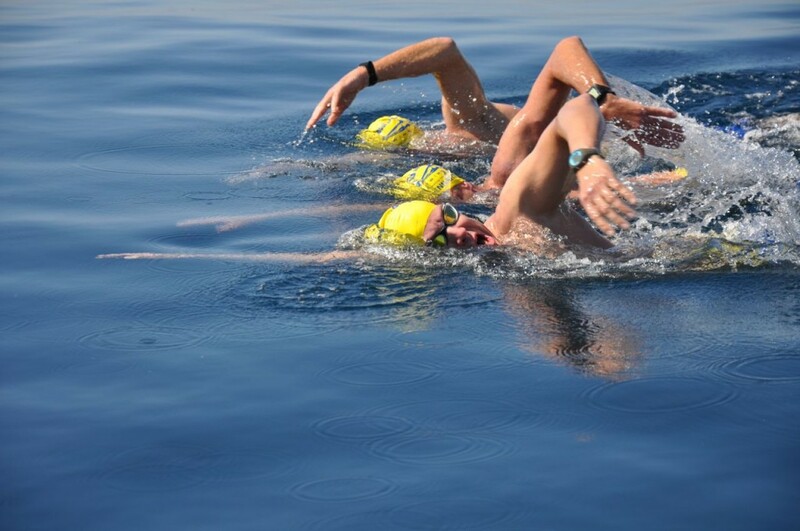 We did the whole swim as a “school of humans” — in close formation and synchronizing our strokes, as shown below. Read about this amazing experience in Crossing Gibraltar Strait: A Journey to Joy. That was so enjoyable that we immediately began planning our next aqua-trek. 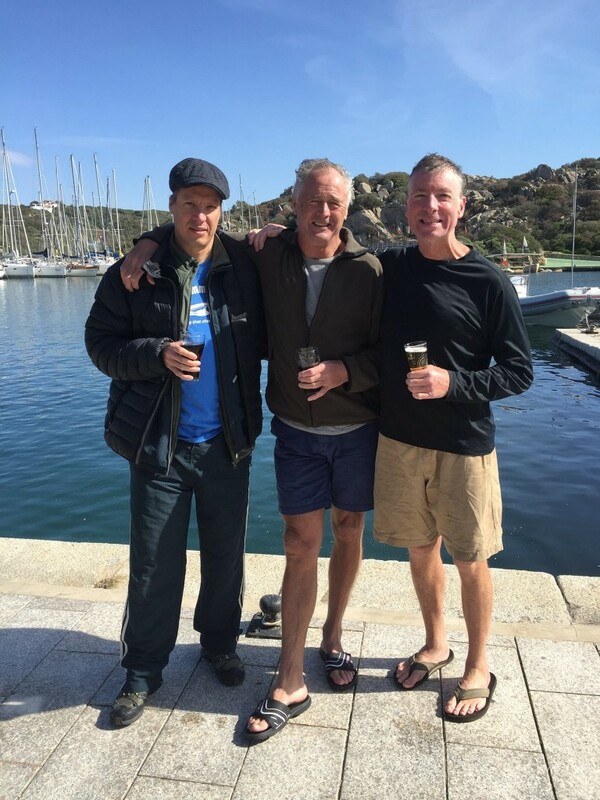 The following week, another close friend–English Channel luminary Nick Adams–swam Corsica to Sardinia with three friends. While Nick has tackled extraordinary challenges–a double Channel crossing and an attempt at a triple–this swim was more of a lark. Only a few had swum Corsica-Sardinia before; Nick and friends were the first to do it sans neoprene. 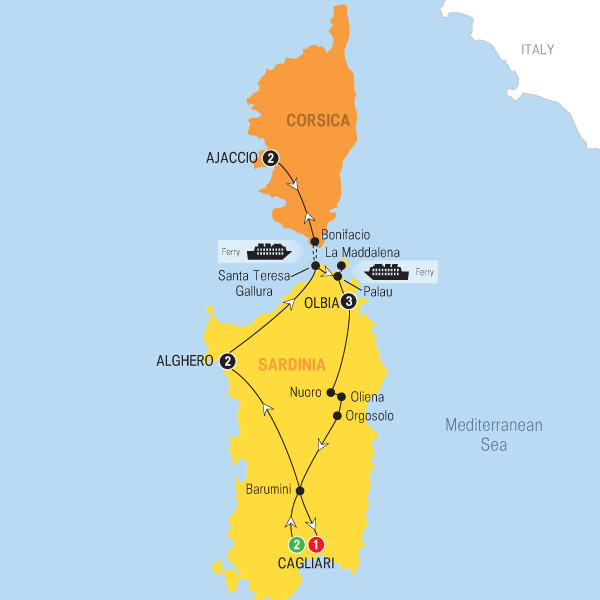 To encourage others to follow in his strokes, Nick had prepared an entertaining and richly detailed “Corsica to Sardinia No BS Guide.” With Nick having done the legwork, and another beautiful Mediterranean strait to cross, our choice was easy. The Strait of Bonifacio is just 12km across at its narrowest point and unlike the English Channel and Gibraltar, currents are a non-factor. Pretty easy pickings when it comes to swimming between countries. I booked a 3-bedroom flat in Santa Teresa di Gallura, a picturesque town with a beautiful bay for swimming . . . and a view of Corsica–shown below–that makes the idea of swimming to it almost irresistible. 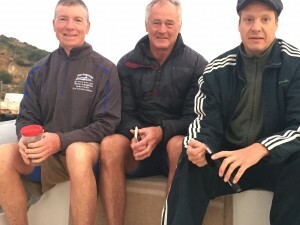 Joining Lennart, Tommi and me are two new friends from Barcelona, who’d swum it–wearing wetsuits–over the summer. We all flew into Cagliari. Oops. 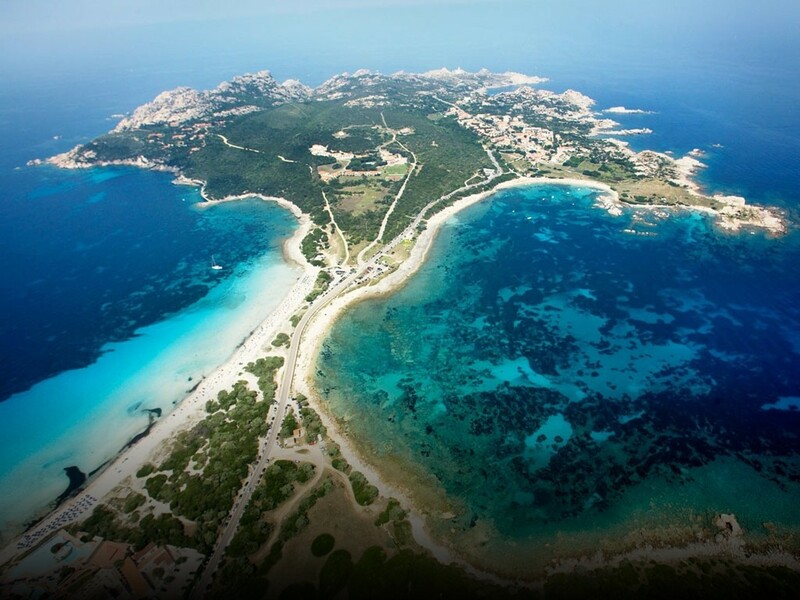 We’d missed Nick’s recommendation to fly into Olbia–just an hour from Santa Teresa. Cagliari was a 5-hour drive. Plus Lennart’s luggage hadn’t arrived. So we took a swim and had a superb Italian (what else?) dinner. Then back to the airport. Still no luggage. So we headed north, arriving after midnight. Friday morning, after sleeping til 8, we made the short walk to Santa Teresa’s central piazza. 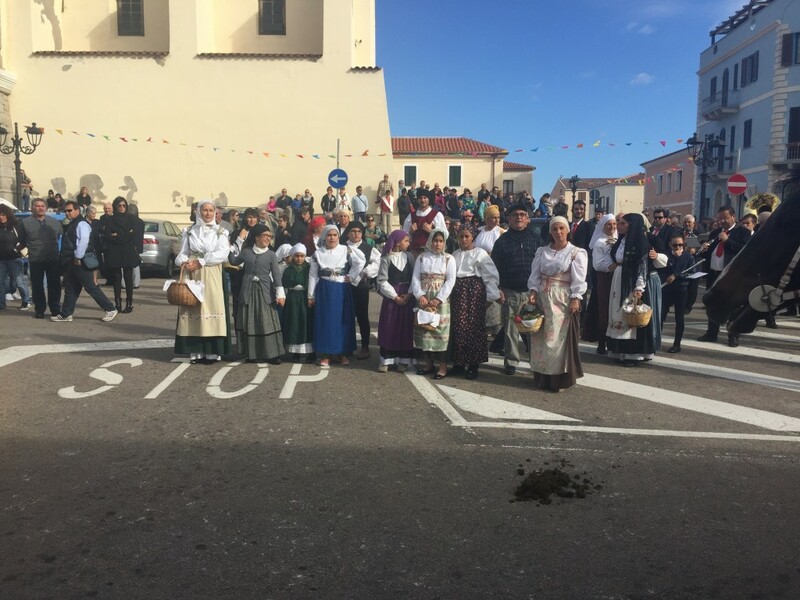 There we were delighted to happen upon a procession with women in folk garb, men in splendiferous uniforms, a marching band, a horse drawn cart with a holy statue and a priest showering all with blessings. We’d arrived in Santa Teresa, fortuitously, just in time for the annual Festa. The day turned overcast with a strong, chill wind churning the sea into whitecaps. Seeking calmer water, we drove to Porto Pozzo, a protected inlet shown below. We swam out-and-back from the small marina at center left to the mouth of the sea at upper left. Unlike the day pictured, there was little water traffic. The water was a bit cool at 18C/64F, but comfortable so long as we kept moving. I tried several times to call Tomasso, our swim organizer and guide but had incorrectly entered his phone number into my iPhone, mistaking the city code for Italy’s country code. We walked around town looking for his dive shop, but no luck. He emailed me late in the day–nervous at not having heard from us. We made plans to meet at his curio shop (he also owns a restaurant and a dive shop) at 10 the next morning. Our meeting on Saturday morning was leisurely and covered only basic details of the swim: Meet on the dock the next morning at 7. Cruise to Corsica. Swim back. Free for the rest of the day, we donned our suits and headed for the bay. Instantly, we regretted not having contacted Tomasso earlier–and thus having the option of swimming Saturday. Conditions were perfetto; Warm sun, mirror-flat water (shown in the ‘5 Guys’ photo) and a light-but-favorable breeze. The next best thing was simply to enjoy. We swam about 50 minutes in glorious conditions, synchronizing every stroke. Then an alfresco lunch at a beachside restaurant . . . why we love swim excursions. We’d checked weather and wind forecasts several times a day since arriving. After several days of winds strong enough to noisily rattle the shutters at our flat, Saturday was the first calm day–going back to before we arrived. We hoped we wouldn’t regret ‘wasting’ it. We awoke around 5:30 on Sunday to the sound of rattling shutters. Tomasso called us at 6:45 confirming what we already knew. The swim was off until at least Monday. Tommi and Lennart took the car and explored a bit. Just five minutes from Santa Teresa, they found this spot. That’s Capo Testa at the end of the isthmus. In the bay on the right, a strong wind was pushing up whitecaps and rolling swells. Just steps away, in the bay on the left, the water was calm with a breeze gently ruffling the surface. The water was as inviting as it looks. For 50 fantastic minutes, we cruised back and forth in synch. Tommi and I finished by ‘racing’ 200 meters–still in synch. We felt ready. Now all we needed was a good day. We only had Monday and part of Tuesday. Fingers crossed. Monday dawned calm with patchy sunshine. It was our day. Around 7:30 am we left the dock on Tomasso’s boat for Corsica. 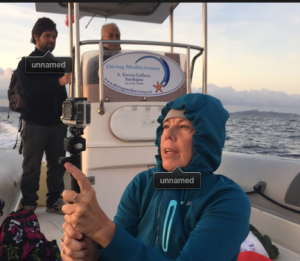 Our crew included Tomasso at the helm, Domenico, a local MD who came along as medical officer, and my wife, TI Coach Alice Laughlin, to take video and photos. All three prepared our hydration and feeds. 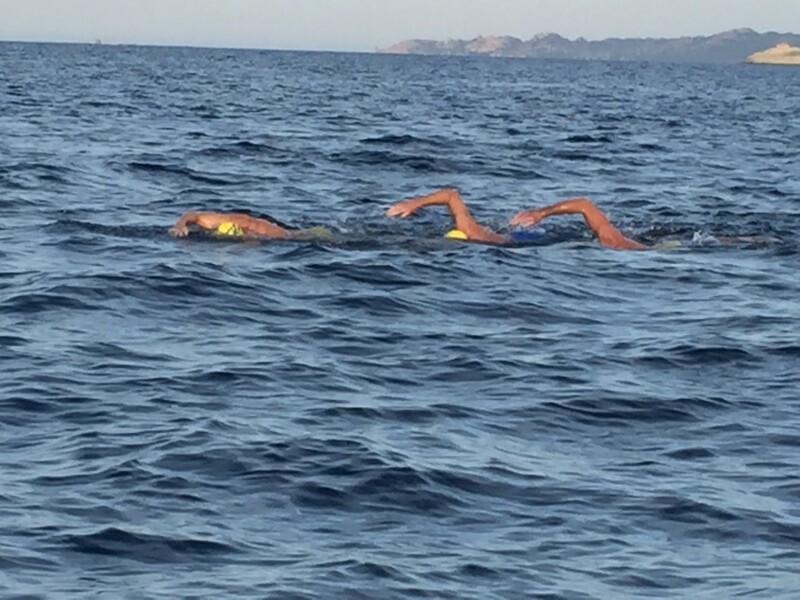 As this would be a relatively brief swim–we anticipated between 4 and 5 hours–I brought only water, a banana and a few packs of energy gel. We left the boat and swam to shore. Once on the beach, we stood clear of the tide line–the customary way to start a marathon–waved a hand, and began. By plan, we’d swim for an hour prior to our first feed, then feed at 30-minute intervals. As I often do, I felt ambivalent in the early going: Do I really want to do this? Am I ready? Will some unexpected impediment arise? After we finished, Tommi said his thoughts at that point had mirrored mine. I banished distracting thoughts with the reliable cure of focus–trying to make every stroke the best it could be. Synchronizing with Tommi and Lennart took more focus than usual too. We’d synchronized with little difficulty during our Gibraltar swim. But during our practice swims the previous three days, it was evident that Tommi had gotten faster, while Lennart had lost some speed. However, Lennart swam straighter which evened things out. Tommi, while the fastest among us, was also more subject to chilling. Slowing his pace would make that more likely. Tommi solved it by periodically veering to the east, then tacking back toward us, covering more distance at a brisker pace. Sometimes I went with Tommi; sometimes I stayed with Lennart. One of my concerns was real though. In September, I’d been forced to drop out of a 10K at Coney Island after two hours and 6K of swimming, because I couldn’t pee. I was fine the first hour, but during the second hour, no matter how hard I tried, nothing came forth–even when I stopped for water at 5K. Once I got out, the bottleneck cleared. It might have been the water temperature–about 65F–but I’d swum much longer in colder water many times before (including Gibraltar) without a hitch. My worries were confirmed about 40 minutes in. Consequently I refused water at the 1-hour mark and again 30 minutes later. I made up my mind to just swim from feed to feed, as long as I could, and hope the problem would resolve somehow. And as is nearly always true, the feed stops came with surprising speed. Often it seemed as if we’d only been swimming for 15 minutes when they beckoned us to the boat. But my discomfort increased steadily. At the 2-hour mark I conceded that I couldn’t swim any longer this way. I exited the water and thought my swim was done. Indeed by the rules of marathon swimming, even touching the boat is grounds for disqualification. The only time we looked to see how far we’d swum or how much remained, was during our feeds. But with each stop, our steady progress toward our destination was evident and we had a growing sense of excitement as the 3-hour mark passed. “Just two more feeds,” we said. Counting down feeds is a common way for marathoners to mark progress toward the finish line. At our 4-hour feed, Tomasso asked where we preferred t finish–at the nearest landfall, a rock face a short distance away, or swim a mile farther to finish on the beach below Santa Teresa. It was an easy call: We’d finish on the beach. In the final kilometer, Tommi and I picked up the pace, replicating the ‘races’ we’d had at the end of our practice swims–yet staying closely synchronized as we did. A short distance from the beach we pulled up, so we could finish all together. Below see the final minute or so before we stopped. And listen to the conversation, around the 1:00 mark where Tommi says “So fun.” Eloquently said, Tommi. If it’s not fun, why do it? One thing that surprised me was how good I felt over the final mile. On a swim that long, I should have drunk at least 1.5 liters of water. But, fearful of ‘pee backup,’ I took only a couple of quick swigs of water, 4 to 6 oz. total. I never felt the need for an energy gel, but I ate a banana, in small bites over several stops. Still, I felt fresh and fast at the end. Swimming in synch with Tommi, I felt like the Energizer Bunny-fish. And the Corsica-to-Sardinia record of 4:22 is just waiting for someone to better it. 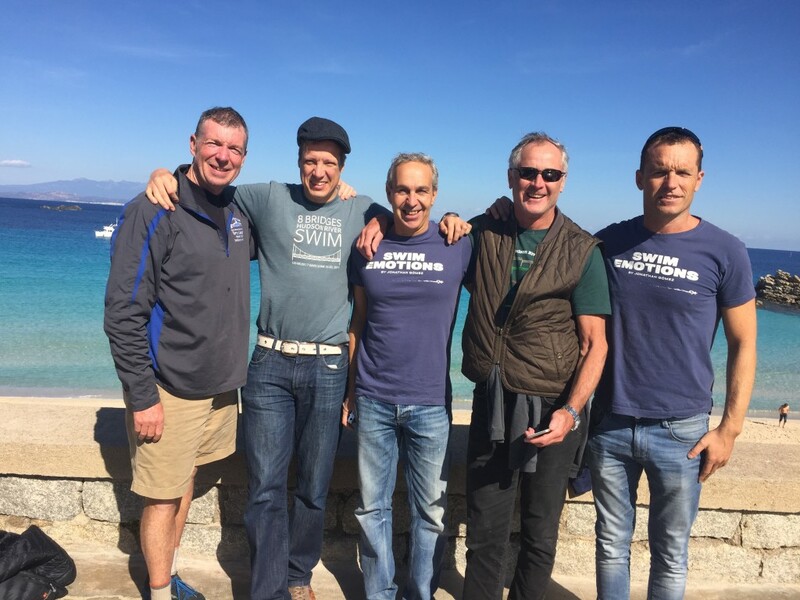 Whether to break a record or simply to have as brilliant an overall experience as we did, if you’d like to swim the Strait of Bonifacio–before crowds of swimmers discover and descend upon it–Nick has kindly agree to let us share his No BS Guide with you. Download here.